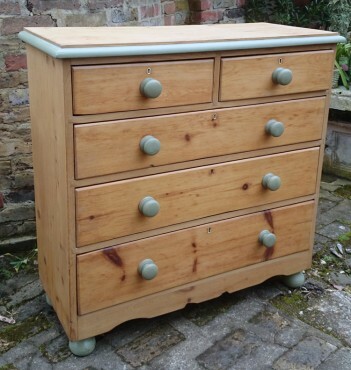 This is an antique pine Victorian chest of drawers with 2 short drawers on the top and 3 long drawers. This has been fully restored, all drawers are running properly and all stops are in place. The details (knobs, quadrant and feet) have been painted using Grand Illusions Vintage style Chalk Paint in "Olive". A practical and attractive piece.